Singers Richard Perlmutter, lead vocals; Elin Carlson, soprano, Susan Boyd, alto; Richard Wells, tenor; Jon Joyce, bass. Plus guest performers. Orchestras Czech Philharmonic Orchestra, British Rias Orchestra. Plus guest performers and soloists. This is the album that started it all. It features Richard Perlmutter's witty, irreverent and hilarious lyrics set to some of the world greatest masterpieces of classical music. On this album are some of Perlmutter's finest gems. There's "Beethoven's Wig" - a description the old master's giant hairpiece set to the immortal "5th Symphony." And "Tchaikovsky's Cannonball," the story of the "big bang" the composer made when he brought a cannon to a performance of his "1812 Overture." Also included is the song that audiences dance along to at every Beethoven's Wig concert, the famous "Can You Can Can?" set to the famous Can Can by Offenbach. Other favorites are "Just For Elise," in which Perlmutter rhymes everything with the name of one of Beethoven's many girlfriends, and "Please Don't Play Your Violin at Night," about Mozart's never ceasing desire to write and play music. As a bonus (one that's included in every Beethoven's Wig album), there are trivia questions about the pieces and the composers. And for kids, parents and teachers there are activities to supplement the songs. At the end of the vocal renditions, each piece is performed without the words by a world-class orchestra, just as it was originally written. "Brilliant, absolutely brilliant!" said Pulse Magazine. This album won Perlmutter his first Grammy Award Nomination and was designated an American Library Association "Notable Recording." 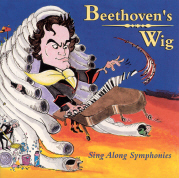 Beethoven's Wig is a timeless classic. A must have for any music collection.